Chances are that sometime in the future you will drive a car with a baby in it. Hopefully the baby will be quiet and will sleep, but any parent will tell you that this won’t happen every time. To have more hassle-free journeys with your baby (or the baby of someone else that you are carrying), these tips will help you. 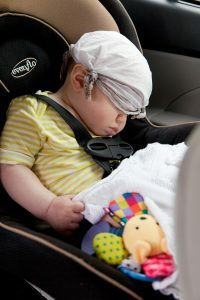 While some babies seem to naturally be comfortable with travelling in a car, falling asleep quickly, others never really take to it, becoming irritable and crying frequently, or being car sick. The sound of a baby crying is naturally distressing and distracting to humans. If you can’t ignore it in the car, you must pull over and calm the baby down. Don’t try to deal with the baby while you are still driving as that is dangerous, and don’t take your baby out of the car seat while you are driving. You’ll need to have an approved child car seat for your baby. Getting your baby used to the car seat while in your house is the easiest way to make your baby feel comfortable sitting in it in the car. Babies are used to having more freedom to roam around and, if they don’t have that, they tend to either be in close proximity to a parent or be in their cot, which will be familiar. A car seat, though, will be restrictive of the baby’s movements. Try bringing your car seat inside and letting your baby play with it. Car seats often have attachments for toys. Sit your baby in the seat and have playtime so start building the association that the seat is safe and fun. Check that the seat fits your baby properly and that the straps are adjusted for both safety and comfort. Babies grow out of car seats, so you may need to make adjustments and eventually trade up for a bigger one. Once the baby is used to the seat, put the seat in the car and take a few short trips while your baby is in a good mood. If you have another passenger (e.g. the other parent) who can ride along and keep the baby occupied, it will help reinforce that being in the car seat is a nice experience. If this isn’t possible, place an item of clothing that you have worn where your baby can grasp and smell it. 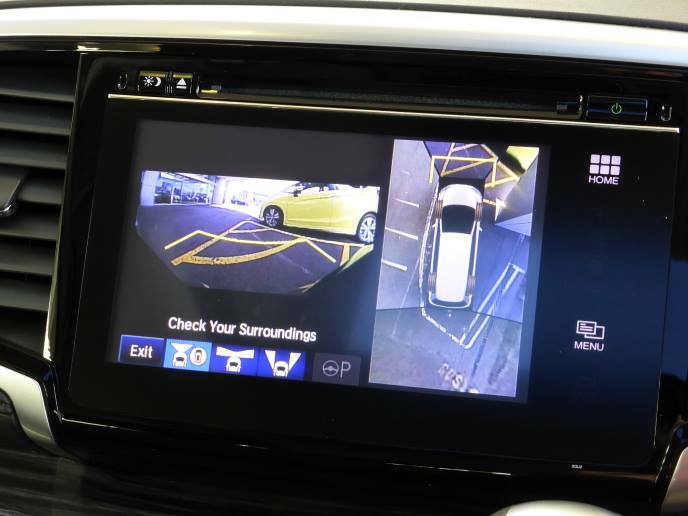 You can also angle a mirror so that your baby can see you. If it’s cold, will your baby need a blanket, or can you use the heaters in the car? If it’s hot, do you have a sunshade, or can you roll the windows down a bit or use air conditioning? Your baby will have an approximate feeding schedule. It’s best to plan where you will stop to feed and change the baby’s nappy. If you can travel when your baby would usually be asleep, this can make for a smoother trip. Taking the baby out of the seat when you stop will give it a break. You’ll need to carry spare nappies and wipes, plus a way to dispose of old nappies (e.g. a few plastic bags), plus spare clothes. Pack it near the top of your belongings because you’ll need it frequently. You may also want to plan a contingency overnight stop in case things go badly, e.g. your baby becomes sick. Knowing towns along your route will allow you to plan ahead where you might stop in these circumstances. Does your baby have an illness that might make it irritable, or make riding in a car less comfortable? If it’s teething, then a teething toy or ring can help. While smoking in a car is not illegal yet, it is not good to smoke in your car with your children present if you value their health. Smoking in your car also leaves toxins in the fabrics that are released over time. 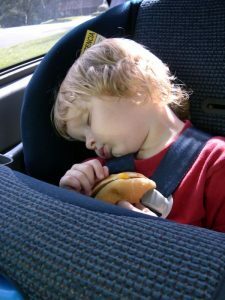 As your baby gets older and becomes a toddler, they might be able to feed themselves simple food, like this toddler in the picture who has fallen asleep with a burger. Don’t neglect liquids, either. In a warm car, a baby can become dehydrated. Do you have specific songs that you know your baby responds positively to? Have you tried a soundtrack that is based on white noise, such as waves crashing? Try different soundtracks and assess the result. Keep your car serviced to reduce the risk of breakdown and so that it runs more smoothly and quietly. Make sure it’s got enough gas before you leave. Make sure that you don’t get dehydrated or hungry as they are both distractions when you’re driving. Stay calm and, if possible, travel with someone else that can attend to the baby. Swap driving duties every couple of hours so that you stay fresh. Do you have to travel by car? If you are going only a short distance, can you walk or take the bus? With either of these it can give you more opportunity to be interactive with your baby.